UPMC Hillman Cancer Center Head and Neck Cancer Specialized Program of Research Excellence (SPORE) aims to improve detection and treatment of head, neck, and oral cavity cancers, and to understand the mechanisms of susceptibility to these cancers. 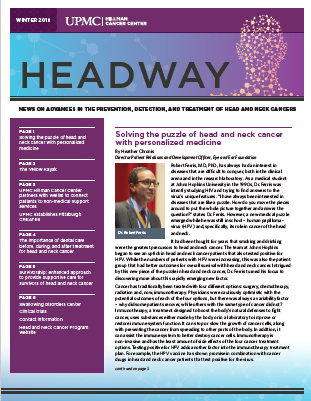 The cores provide support for the main research projects, developmental research projects, and career development investigators to facilitate head and neck cancer translational research. The two SPORE research cores are the Histology/Tissue Banking Core (Core B) and the Informatics, Biostatistics, and Bioinformatics Core (Core C). The Administrative Core (Core A) provides scientific and fiscal oversight for the program. SPORE investigators work together as a team to meet the goals of the program and also interact with investigators from Head and Neck Cancer SPOREs at other institutions to improve outcomes for patients.